Shopping for a new Jaguar E-Pace? If you’re considering a high-end E-Pace, stepping up to the larger F-Pace makes a lot of financial sense as prices climb fast for the smaller Jag. The 2019 Jaguar E-Pace is a strong, fun-to-drive entry to a red-hot city luxury crossover market. With a gaping grille, swept back headlights, and muscular sheet metal, the 2019 E-Pace echoes other vehicles in the Jaguar lineup, one of the best-looking collections out there. A long(ish) hood and sloping roofline suggest a rear-wheel-drive bias, but the E-Pace hides its front-wheel-drive based architecture cleverly. Inside, the design is considerably less expressive, borrowing cues from the F-Type sports car but ultimately emphasizing straight lines and function over form. Unfortunately, some materials feel unworthy of a luxury vehicle, and though the dashboard seems utilitarian. It’s not as smooth to use as it could be given the brand’s history blending form and function. Power is supplied by a 2.0-liter turbo-4 offered in two different states of tune: 246 horsepower on the standard engine or 296 hp as an option. A 9-speed automatic transmission is the only gearbox. All-wheel drive is standard, but there are two different forms. 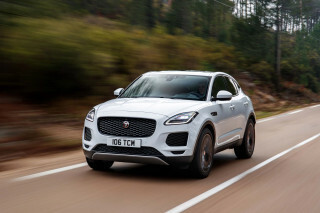 The higher-powered engine comes with an Active Driveline system borrowed from the Range Rover Evoque (with which the E-Pace shares a platform), allowing this little Jag to shuffle power front-to-back and side-to-side at will. This improves handling significantly as well as grip in slippery situations, even off-road to some extent. Speaking of handling, the E-Pace uses its short wheelbase and potent powertrain pleasingly, offering tight turn-in, excellent road-holding manners, and a reasonably comfortable ride. Power delivery is adequate on the higher-output model, but the transmission often feels a step behind. Despite its small footprint, the E-Pace fits four adults comfortably, better than competitors like the Mercedes-Benz GLA-Class and BMW X1, and could even be compared to larger off-beat options such as the Alfa Romeo Stelvio. For 2019, the E-Pace receives a few small updates to its InControl Touch Pro infotainment system, including an optional Smartphone Pack that includes Apple CarPlay and Android Auto compatibility. Two additional paint colors, Narvik Black and Caldera Red, join the stable as well, and S models and above get new 20-inch wheels. The 2019 Jaguar E-Pace has not yet been crash tested by the federal government’s NHTSA or the independent IIHS. It manages 24 mpg combined in base configuration and 23 mpg combined with the more powerful engine. The 2019 Jaguar E-Pace blends sculpted and sharp lines with a pleasing profile and looks right at home among the brand’s sleek stable. Though the E-Pace is relatively tall among its competitive set, sculpted lines low down on the body and flared wheel arches bring the visual weight down, making for a sleek, sporty-looking crossover. A longer hood suggests sports-car-like dynamics, but the E-Pace is front-wheel-drive based like its Range Rover Evoque sibling. A higher, tapered rear end yields a forward-leaning profile, like a big cat ready to pounce. You know, like a panther or something. Higher-trim R-Dynamic models turn up the visual flair with up to 20-inch wheels and more aggressive styling features. Inside, the E-Pace echoes the F-Type sports car with a driver-centric cockpit design, but some subpar plastics and other materials make this luxury crossover feel less luxurious than other competitors. Coupled with boring lines and a lack of unique details, the E-Pace feels less special inside than it is to look at. Despite its racy looks, the 2019 Jaguar E-Pace isn’t a drag strip star, but its two all-wheel-drive systems and handling manners make up for the powertrain. 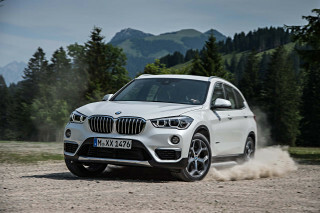 A 2.0-liter turbo-4 is the only engine option, though is available in two different states of tune. Base (P250) models get 246 horsepower while R-Dynamic (P300) E-Paces put out 296 hp, and as you may have imagined, the more powerful engine is the one you want. Unlike other competitors, all-wheel-drive is standard. The E-Pace uses two different systems to deliver power to all four corners. The base system operates at a 50/50 power split front-to-rear, but the R-Dynamic system in the P300 can vector torque to any wheel independently, providing exceptional grip during spirited driving or in slippery situations. The only transmission available is a 9-speed automatic that, despite its high gear count, feels sluggish and somewhat unmatched to the engine when pushed. Even on 20-inch wheels, the ride is comfortable and composed and the cabin is quiet, a welcome feature as the turbo-4 has a gruff exhaust note that’s better left unheard. 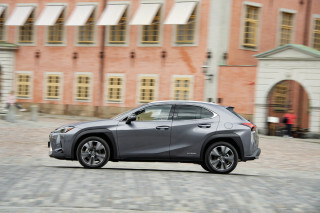 Steering is light but turn-in is direct, and handling is surprisingly spry, matching even some lower-slung compact luxury sedans in competence. Surprisingly spacious, the 2019 Jaguar E-Pace is practical but not particularly posh. Though it competes with the smallest luxury crossover SUVs out there, the E-Pace is actually somewhat larger, wrapping the dimensions and feel of the Land Rover Discovery Sport in a sleeker shape. 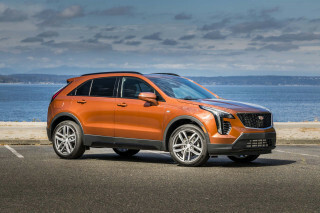 Thanks to a transverse engine and front-wheel-drive architecture, the cabin is surprisingly large for a small SUV, even for taller occupants up front. The rear seat can get slightly cramped, but with more than 35 inches of legroom, two adults should fit comfortably for longer periods of time. Cargo space is ample too, with 24.2 feet of space behind the rear seat and more than 52 cubes with them folded flat. That’s 7.2 and 9 more cubic feet than the Mercedes-Benz GLA-Class, for comparison. Even loaded to the gills, the E-Pace leaves something to be desired in the material quality department, featuring hard plastics and uninspired details in many places that are more befitting of a rough-and-tumble Land Rover than a Jag. Contrasting stitching and colors on the R-Dynamic trim help turn up the intrigue, but Jaguar’s understated interior design language is doing the E-Pace no favors here. For its low sales volume, the 2019 Jaguar E-Pace lacks crash test data but includes some standard active safety features. With six airbags as standard as well as forward collision warnings, automatic emergency braking, and blind-spot monitors on most trims, the E-Pace does include most modern safety tech. 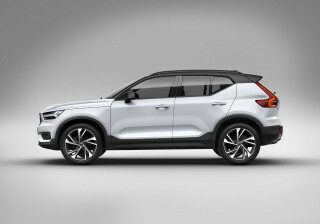 A surround-view camera, parking sensors, and a forward mounted camera to see around obstructed intersections are available, as well as advanced features such as adaptive cruise control. Good features and warranty coverage give the 2019 Jaguar E-Pace a leg up, but prices climb very fast, negating the value proposition. Base E-Pace models get 17-inch wheels, cloth seats, keyless ignition, a rearview camera, LED headlights, dual-zone climate control, and a 10.0-inch touchscreen infotainment system that’s been updated this year to include Apple CarPlay and Android Auto compatibility as part of an optional Smartphone Pack (and one nearly every E-Pace to set wheels in the U.S. is likely to have). Bluetooth connectivity is standard, as well as USB ports up front. That’s all par for the course among compact luxury crossovers, but the E-Pace’s nearly $40,000 base price is significantly higher than some competitors. A 5-year/60,000-mile warranty is enticing, though, especially taking Jaguar’s less-than-stellar reliability reputation into account. Of course, the base E-Pace isn’t the one you really want, and S, SE, HSE, and R-Dynamic models get pricey fast, climbing over $53,000 for the top-tier R-Dynamic HSE model. S trims get 18-inch wheels, power adjustable front seats, leather upholstery, and parking sensors, while SE versions get 19-inch alloy wheels, a power tailgate, premium audio, and additional advanced safety features such as adaptive cruise control. The range-topping R-Dynamic HSE gets 20-inch wheels, upgraded leather, a motion-activated tailgate, head-up display, and adjustable bolsters and thigh support to go along with its more powerful engine. Sporty design details come along with R-Design models as well, including blacked-out intakes and mirrors and contrasting stitching in the interior. The 2019 Jaguar E-Pace earns middling fuel economy from its duo of turbo-4 engines. The EPA rates both the less and more powerful versions of the E-Pace similarly, with a slight penalty for the 296-horsepower version. The standard 9-speed automatic transmission helps on the highway, but all-wheel-drive hampers numbers somewhat. The less powerful E-Pace gets 21 mpg city, 28 highway, and 24 combined, while the more powerful R-Dynamic model manages 21/27/23 mpg. Premium fuel is required for both models. 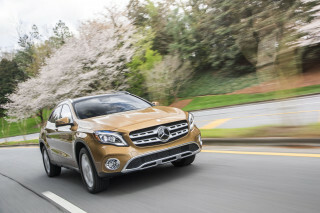 Several competitors top 30 mpg on the highway even with all-wheel drive. Looking for a different year of the Jaguar E-Pace?